Background: Job related stressors are becoming a huge burden on the quality of nursing care. Stress has an impact on individuals health, wellbeing and job satisfaction. It also has a negative impact on the degree of absenteeism and turnover that nurses and other medical professionals exhibit. The aim of the study was to identify the different job-related stressors in hospital that affect nurses job satisfaction from a multicultural perspective and examine how these two variables were correlated with each other. Design: A cross-sectional descriptive correlational design was used. Method: A convenience sampling was composed of 150 nurses stationed at different levels of education in the intensive care department. The sample included male and female registered nurses who had been working in their respective institution for six months. The research instrument used to gather the data was the Expanded Nursing Stress Scale (ENSS) and the Job Satisfaction Scale (JSS). Statistical Package for Social Sciences (SPSS) version 20 was used. Results: The most stressful factors included criticism and conflicts, which negatively affect job satisfaction. Studies showed that the environmental stressors, like unclear and ambiguous job roles and unequal treatment of nurses are as important as the internal stress factors, including the personality types. Nurses are exposed to inadequate conditions of work where they are not appreciated, receive low-payment and no benefits. The job satisfaction of the participants is relatively low (M = 3.8; SD = 0.43). As the results showed, the respondents were particularly dissatisfied with their pay (M = 1.46; SD = 0.63) and fringe benefits (M = 2.14; SD = 0.95). Low job satisfaction is a result of high stress among respondents and the character of stressors. There is a positive correlation between disagreement in treatment of patient and demands of work (p = 0.017; p < 0.05); demands of work is positively correlated with decisions under pressure (p = 0.014; < 0.05). Conclusion: High stress and workload is disproportionate to the payment provided to nurses. The cumulative increase of stress among nurses will eventually affect the quality of services and care of patients. Work conditions need to be improved in terms of disseminating responsibilities, not delegating work to nurses who are overloaded with bedside nursing care, and providing enough time for nurses to relax. Strict protocols have to be implemented in terms of interaction between patients and non Arabic speaking nurses to prevent exposure to any type of conflict and misunderstanding. Nursing has been identified as one of the most stressful professions. Stress has hazardous impact on the individual and organizational levels. Health, wellbeing and job satisfaction are affected by stress on the individual level, while absenteeism and turnover are examples of negative stress influence on the organizations; stress also impairs the quality and efficacy of healthcare services (Sharma, Davey, Shukla, Shrivastava, & Bansal, 2014). Generally, there are four sources of anxiety among nurses: patient care, decision making, taking responsibility, and change. Recognizing that nurses play an important role in hospitals and medical institutions; it becomes necessary to study the different factors that affect their job satisfaction and performance. One of these factors is stress. It has long been established that nursing is one of the professions that is most commonly associated with increased stress levels and turnover rates. Additionally, with the changes that are expected to come as a result of the rollout of new technologies, the level of stress that nurses will experience can be expected to increase (Jennings, 2008). Chien & Yick (2016) conducted a study about the role of work stress and strain on nurses from an international perspective. They noted in the results of their study that nurses are indeed some of the most stressed and strained professionals across many industries, and on a global scale. This applies to both private and public hospitals and medical institutions although stress levels were particularly higher in public institutions. Lambert & Lambert (2001) also conducted a study on the same topic and they too arrived at the same findings. They, however, recommended the implementation of further studies because the majority of the studies they reviewed in their literature review only covered nurses employed in hospitals and medical institutions in the United States and the United Kingdom. That recommendation by Lambert & Lambert (2001) makes sense because the medical and health care industry usually differs from one country to another. This was the same argument that Burnard et al. (2008) echoed when they conducted a study about the factors that can be identified as occupational stressors in the nursing profession across different countries. Some of the stressors that were identified include, but may not be limited to, cultural values, education and training, and healthcare policy variations. According to Happell et al. (2013), occupational stress can be reduced by involving nurses in identifying initiatives and enhancing the understanding of occupational nurses stress. Nurses managers must be entitled to enhance and facilitate stress reduction initiatives by understanding the problem and engaging nurses so they too can participate in the process of finding proper solutions. In a study that was authored by McVicar (2003), he identified the different causes of stress in the nursing profession. Some of those he mentioned include workload, inadequate staff, time pressure, poor communication and relationships with colleagues, ineffective leadership and management style, poor locus of control, poor group cohesion, and lack of adequate supervisory support. Workplace stress management interventions can be grouped into three categories according to Landy & Conte (2010). Primary, secondary, and tertiary stress management and prevention strategies can result in more positive nursing stress management outcomes. The goal of primary prevention strategies is to eliminate the sources of stress altogether. Secondary strategies work by training nurses to react and respond to the stressors appropriately. Lastly, tertiary strategies focus on the actual process of addressing the impact of stress on nurses. An effective stress management and prevention strategy is one that incorporates varying levels of primary, secondary, and tertiary strategies, and one that is modelled on the actual needs of the target group of nurses based on the environment that they work in (Landy & Conte, 2010). Job stress among nurses could be affected by their role in the health care facility and their gender. According to the study conducted by Iyer (2017) among Indian nurses; it was revealed that nurses perceive conflicting demands of their performance and ambiguity of their roles as the main source of job-related stress. Particularly if nurses are appraised by their superiors in a different manner (unequally) and their roles in the facility are unequally distributed (concerning their gender), job satisfaction would be particularly low and the stress level very high (Iyer, 2017). As this study confirms, nurses value their appreciation and equal treatment on the job, which has to be considered by their managers, superiors, and executives. Nursing is a stressful profession, which requires appreciation of their superiors as well as proper training to avoid burnout. As García-Izquierdo, de Pedro, Ríos-Risquez, & Sánchez (2018) revealed, work overload and interpersonal conflicts, lack of social support, and violence from patients can lead to the development of burnout (chronic stress) in nurses, which would be very difficult to treat. While these stressors are difficult to avoid since they are part of the nursing profession, it is possible to train nurses in developing resilience (García-Izquierdo, de Pedro, Ríos-Risquez, & Sánchez, 2018). Resilience can help nurses to overcome stress and not to develop long-lasting emotional effects as a reaction to stressful situations. In addition to resilience, communication in the team has to be productive and supporting to prevent burnout and decrease stress. A study conducted by Fuqua (2013) recognised that nurses, who work in a productive team where members are eager to help each other and provide emotional support, tend to have lower stress levels and have higher job satisfaction compared to their counterparts working in less positive conditions. As nurses work in the environment where they have to interact with many stakeholders and make emergent decisions, reliance on colleagues and effective communication in the team are essential (Fuqua, 2013). Since higher quality of care is correlated with job satisfaction in nurses, the improvement of nurses teamwork and communication are crucial in this case. At the same time, the level of stress is not always connected to the environmental factors, very often it is also linked to internal factors. Particularly, Ghasemian & Kumar (2017) managed to prove their hypotheses claiming that there is a correlation between the personality type and stress in nurses. As the results revealed, nurses with type A personality, who are usually restless, tense, impatient, and workaholic, are prone to high levels of stress, while those with type B personality, who are more easy-going, tolerant, and relaxed, have lower levels of stress (Ghasemian & Kumar, 2017). These results showed that nurses have to consider their personality type and their personal character before entering the profession of nursing. It is also important to make sure that the nurses with type A personality receive proper training to help them to deal with their characteristic traits that decrease their stress resilience. The nurses attitudes towards, and relationships with, their colleagues can also have a significant impact on the levels of stress that they experience. Economic factors such as pay levels (i.e. wages) may also contribute to their stress levels, according to Sharma et al. (2014). Generally, nurses expect to receive higher pay for jobs that demand they take care of a higher volume of workload. Studies have shown a great effect of stress on nurses job satisfaction in general. Complexity of critically ill patients conditions and work load in hospital put nurses under extra stressors. A research study that correlates role of job stressors on nurses satisfaction rates is required to further decrease the negative outcomes on nurses. In this study, the researcher hypothesized that there is a correlation between the two factors, namely job related stressors and job satisfaction among nurses. To combat this, the aim of the present study was to identify the different job-related stressors that affect the nurses job satisfaction, from a multicultural perspective and examine how these two variables are correlated with each other. A convenience sampling technique was used in this study to recruit 150 nurses. They were asked to answer the ENSS and JSS questionnaires. In addition to that, a cover letter was attached to these scales to make sure that nurses understood all aspects of the study before they gave their consent to participate. The sample included male and female registered nurses who had been working in their respective institution for six months. The sample excluded newly hired nurses because of their short experience in the hospital. The administration of the selected setting was contacted and approved the conduct of the study. Authors of the instruments gave consent to use the questionnaire to collect data for this research. Participants were informed that their participation is voluntary. The ENSS was used to describe nurses level of work-related stress. The ENSS is a 57-item scale that can be answered using a five point Likert Scale. There are essentially five choices with 1 representing never stressful and 4 representing always stressful. The number 5 represents the items that do not apply to the participants. The ENSS is divided into nine sub-scales, each one by itself is basically a work-related stressor: death and dying, inadequate emotional preparation, conflict with physicians, peer-related problems, supervisor-related problems, work load, treatment uncertainty, patient and family-related problems, and workplace discrimination. To interpret the questionnaire, one has to look at the average score per cluster and for the entire questionnaire. Higher scores indicate higher stress levels (French, Lenton, Walters, & Eyles, 2000). The second questionnaire was the Job Satisfaction Scale (JSS). Unlike the ENSS, the JSS contains questions that can be answered using 6 choices (numbers 1 to 6), based on the level of agreement or disagreement with the questionnaire items. A score of 1 represents the strongest disagreement while a score of 6 represents the strongest agreement (to a questionnaire item). There are nine clusters under the JSS and they are: pay, supervision, promotion, fringe benefits, contingent rewards, operating procedures, nature of work, and communication (Spector, 1985). Nurses demographic data were collected using a special form that was designed for this study. Age, gender, department practice setting, level of education were collected and used as additional variables for comparing any significant differences in job related stressors present in between. Hospital in Riyadh, Saudi Arabia. After the respondents were recruited, the researcher distributed a written consent form to the participants. Data that were retrieved from the survey was protected by the login and password available only to the researcher. Raw data was destroyed after the data analysis. The participants had the right to withdraw from the study at any time. In addition, after the research was conducted, respondents had a right to ask for the results. SPSS version 20 was used. Specifically, the researcher calculated the descriptive statistics and correlational analysis. It was important to determine the characteristics of the respondents, to determine how various factors affect stress in nurses, and detect how these factors are correlated. The results were generated with the help of SPSS statistical analysis by calculating descriptive and correlational statistics. The following table represents the demographic characteristics of participants. 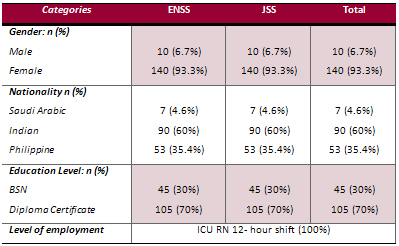 Table 1 showed that all participants (n = 150) filled in both questionnaires, including Expanded Nursing Stress Scale (ENSS) and Job Satisfaction Scale (JSS). The vast majority of respondents were females (93.3%); the largest ethnic group was Indian nurses (60%); most participants have certificates only (70%) and only some of them (30%) have BSN. All of respondents were employed as RNs in the ICU department, who work 12-hour shifts. As Table 6 reveals, there is a positive correlation between the disagreement in treatment of patient and demands of work (p = 0.017; p < 0.05); demands of work is positively correlated with decisions under pressure (p = 0.014; < 0.05); criticism is positively correlated with decisions under pressure (p = 0.019; < 0.05); disagreement in treatment and the death of a patient were also positively correlated (p = 0.02; < 0.05). It is possible to imply that the correlation between these stressors can be explained by the nature of work and the level of stress caused by a specific stressor. For example, criticism and decisions under pressure are positively correlated due to their connection. In case of exposure to criticism, the nurses are forced to make decisions under pressure. Disagreement in treatment and the death of the patient can be correlated because of an inner stress in nurses like the errors in treatment that could cause a fatality. 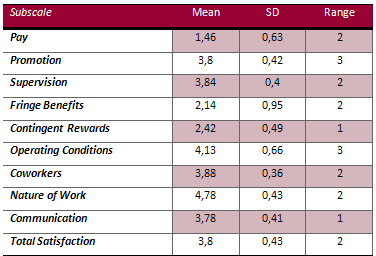 Table 7 determined that the job satisfaction of the participants is relatively low (M = 3.8; SD = 0.43). As the results showed, the respondents are particularly dissatisfied with their pay (M = 1.46; SD = 0.63) and fringe benefits (M = 2.14; SD = 0.95). The standard deviation (SD) of fringe benefits shows that almost all respondents agreed on their dissatisfaction with this item. At the same time, the participants rated their nature of work very high (M = 4.78; SD = 0.43). Operating conditions also received high rating (M = 4.13; SD = 0.66). Overall, as data showed, participants are not satisfied with their benefits and financial reimbursement since these items were rated the lowest. As the results of current study revealed, the job satisfaction among the respondents was quite low. The highest-rated stressors were criticism and conflicts at work as well as discrimination. Current results were supported by previous studies implying that stress at the individual level affects job satisfaction (Sharma, Davey, Shukla, Shrivastava, & Bansal, 2014); poor interaction in the team, lack of group cohesion, ineffective rewards, and poor payment were named as the main stressors in the nursing job (McVicar, 2003; Sharma et al., 2014). Previous studies recognized that stress among nurses is elevated (Jennings, 2008; Lambert & Lambert, 2001; Chien & Yick, 2016). As current results showed, nurses were dissatisfied with payment and benefits of their job, which have become the main contributors to the overall satisfaction rating. The study recognized that high levels of stress are present among respondents. Previous studies determined the same pattern reporting that nursing is a highly stressful occupation linked to the character of this job, the conditions of work, and the financial benefits (Jennings, 2008; Lambert & Lambert, 2001; Chien & Yick, 2016). These findings were supported, as the current study determined an elevated level of stress in nurses and their dissatisfaction with benefits and payments. It is possible to speculate that nurses were lacking managerial support. Low payment was recognized too by McVicar (2003) as one of the main stressors in the nursing profession. Workload was also connected to high stress levels among respondents, which was indicated by these results. However, this factor was rated slightly lower compared to other clusters. This specificity could be connected to the initial expectations of the nurses when they enter the profession. It is a well-known fact that a nursing is job with high workload, which could become a stressor. Yet, this is a characteristic of a job with which the graduates are familiar. As a result, while workload contributes to the elevation of stress among nurses, they are prepared for these conditions. The current study detected that nurses are satisfied with their colleagues and the qualifications of their supervisor. However, the criticism and conflicts have become major stressors for all respondents. It is clear that they encounter criticism at all levels, which is hard to manage for newly employed nurses. Nurses have to maintain a balance between satisfaction of their patients and compliance to the rules developed by their supervisors, physicians, and nursing leaders, which become problematic. The aim of the current research was to determine the set of job-related stressors in nurses that affect their job satisfaction. As the results recognized, the most stressful factors include criticism, conflicts, and discontent with benefits and payments, which negatively affect job satisfaction. Studies showed that the environmental stressors, like unclear and ambiguous job roles and unequal treatment of nurses are as important as the internal stress factors, including the personality types. Nurses are exposed to inadequate conditions of work and receive low-payment and no benefits. Low job satisfaction is a result of high stress among respondents and the character of stressors. Previous studies have drawn the same conclusions admitting that high stress and workload is disproportionate to the payment provided to the nurses. This situation has to change as soon as possible, as continuous increase of stress among nurses will eventually affect the quality of services and will affect health of patients. The study has several limitations. First of all, it is a descriptive cross-sectional design which could not interpret the causal relationships among the variables. In addition, the sample is not homogenous in terms of gender. The vast majority of respondents were females, which could affect the generalization of results. The study recruited participants from one facility and the results may reflect the conditions in this specific hospital, which also affect generalizability of the findings. Nurses need to be encouraged in their work and the work environment needs to be re-designed to decrease stressors. The author is grateful to all parties who were so kind to participate in the current research, particularly the respondents, who found time to take part in the survey. Current research was not affected by any conflict of interest and it was self-funded. Burnard, P., Edwards, D., Bennett, K., Tothova, V., Baldacchino, D., Bara, P., & Mytevelli, J. (2006). A comparative, longitudinal study of stress in student nurses in five countries: Albania, Brunei, the Czech Republic, Malta and Wales. Nurse Education Today, 134-145. Chein, W., & Yick, S. (2016). An investigation of nurses job satisfaction in a private hospital and its correlates. The Open Nursing Journal, 99-112. Electives Network. (2017). King Khalid University Hospital. Retrieved from https://www.electives.net/hospital/6479/preview. French, S., Lenton, E., Walters, V., & Eyles, J. (2000). An empirical evaluation of an expanded nursing stress scale. Journal of Nursing Measurement, 161-178. Ghasemian, A., & Kumar, G. V. (2017). Relationship between personality types and stress: A comparative study among male and female nurses in health care setting. Journal of Psychosocial Research, 12(2), 347-354. Happell, B., Dwyer, T., Reid, K., Burke, K., Caperchione, C., & Gaskin, C. (2013). Nurses and stress: recognizing causes and seeking solutions. Journal of Nursing Management, 638-647. Iyer, R. D. (2017). Moderating effect of gender on the relationship between role stress and job satisfaction among nurses in Mumbai. Journal of Management and Public Policy, 9(1), 41-52. Jennings, B. (2008). Work stress and burnout among nurses: Role of the work environment and working conditions. Patient Safety and Quality: An Evidence-based Handbook for Nurses. KAU. (2017). About Hospital. King Abdulaziz University Hospital, Retrieved from http://hospital.kau.edu.sa/Pages-about.aspx. King Khalid University Hospital. (2017). King Khalid University Hospital. Retrieved from http://ksu.edu.sa/en/about-ksu/hospitals. Lambert, V., & Lambert, C. (2001). Literature review of role stress/strain on nurses: an international perspective. Nursing and Health Sciences, 161-172. Landy, F., & Conte, J. (2010). Work in the 21st Century: An Introduction to Industrial and Organizational Psychology. Wiley, Malden, MA. McVicar, A. (2003). Workplace stress in nursing: a literature review. Journal of Advanced Nursing, 633-642. Sharma, P., Davey, A., Shukla, A., Shrivastava, K., & Bansal, R. (2014). Occupational stress among staff nurses: Controlling the risk to health. Indian Journal of Occupational and Environmental Medicine, 52. Spector, P. (1985). Measurement of Human Service Staff Satisfaction: Development of the job Satisfaction Survey. American Journal of Community Psychology, 693-713.